We propose to create in this agreement a private arts and democratic business society that is the body corporate set to manage the offices and non-exclusive sales teams for a cutting edge full service new media creative agency and production house in Auckland. Our directors and partners have coalesced their equipment and skills into a large production studio consisting of multiple photo and audio recording suites, integrated events and promotion capabilities, a technology marketplace, timeshare CBD offices in Wyndham street, an artistic internship scheme, and yearly high-technology conference. Audio, Video, Events, Games, Augmented Reality, Animation & CGI, Home Automation, Still Photography, Network Security, Business Mentoring, Artistic Consulting, Network Marketing, Equipment Hire & Sales, Talent, Website Design Build, Mobile App Dev, Interactive Installations, and generally speaking, stuff that is super awesome fun stuff. Excludes anything involving victimisation, violence, etc. We can do a documentary about violence, but we can’t use the fund to set-up forced labour camps along the Mekong. Directors may use the space for what-ever purpose they wish within reason. As well as being a group of creative capitalist professionals wanting to save costs and share an office, we are hoping to set something in motion to become a creative lead referral service and matching agency that links artists with businesses. Participation in The Raven is always 100% voluntary. Incentives for positive action are championed over penalties for inaction generally, and this agreement contains very little restrictions and liability on you. The Raven’s individual companies and sole traders, as well as The Raven’s own business ecosystems depend upon information about existing and potential clients, and our ability to accurately and fairly communicate the value of our sales propositions and previously done work articles and deliverables to them in order to satisfy demand and therefore source new and continued patronage. Since information is the lifeblood of so many parts of our sales and support pipelines, good information security practices but also importantly lead declaration and financial participation shall be incentivised by the automatic allocation of company shares the disclosure of information on security, declaration, quotes, invoice payment, deliverables, ethics and honesty. Signing this agreement and declaration of intent in no way possible causes any increased liability than those in Schedule A namely your equal share of the costs of the first year of operation. After working through the night, and then a day, Tom goes through the clauses of the contract. Much of this detail is subject to change, and in fact, an entire re-organisation and re-formation of the arts network is likely, this time, powered and controlled from Tomachi Corporation! We are offering 2 years financing for bands, local artists, and other self employed people to spend a day with us setting up your website. Normally, 3 to 4 hours with Tom in Auckland onsite at your premises would cost $240-$320, which would be enough to cover setting up the site, picking a theme, publishing of the initial pages. Paid over 2 years this is only $10/month. The after 3.3 years or so, you qualify for forever free hosting and it can drop to $0. All direct debit clients receive forever free website hosting, so long as account is active or has paid the minimum to qualify. We use open source technology and try to always ensure you have the ultimate control over your own domain. Therefore we usually ask our clients to pay for their own domain names on their own accounts, but to add [email protected] as an admin so we can make changes if needed quickly. Having said that, we are happy to pay for your domain name if you prefer! For new clients, we suggest a weekly cycle, with entire project delivery taking not more than 12 weeks. b) if no agreement reached then via normal termination of two full payments and one part payment. The following applies to clients who pay via direct debit. Do you want a website? Call it insane, but TCorp has just announced totally forever free website hosting - for all my clients over $400 - now you don't have to be a personal friend of mine to get an abnormally cheap website. Lookin' at you Junior aka crossbeat.funk.nz and KathyReady.net! Oh and my contra-deal with Aum Productions (aum.co.nz) since I'm paid in tickets to their awesome Psy-Trance music festival events. Our direct debit agreement is like insurance against big website bills because your monthly bill will never go up unless you agree to it! Our "pay what you think it's worth" retainer based system is based on an internally calculated rolling average of the time we have used on your project. Your regular payment will never go up by surprise or without your express consent usually confirmed as a single click on an email proposal. But you can call and email me with questions and issues to sort without concern for bills; I will only ask for an increase if I feel the amount of time spent is becoming too large. Cancellation is just as simple by email and never results in any drop in service and your website stays online hosted in USA at Dreamhost. But seriously, paying pros to make websites can get expensive so depending on your skill and ability to put in effort to *build your own website yourself with my help*, it's usually between $160 and $800 for me to set you up with whats called self-hosted WordPress, and I can even do fixed monthly service to pay off a large project over longer period. Our hosting is forever free so that we can just focus on providing great service to you, not milking you for cost-free automation and toiling over quotes and project sign-offs. See our services page for more info. Basically dream up something that will use at least $400 of my time, which at $80/hr would be about 5 hours, and boom.... you're own website sorted. Whether you pay in one hit, or ten payments of forty, it can work. See here for the legal stuff - but there's no catch, it's sensible: no illegal / objectionable content, and no personal backups - just websites. 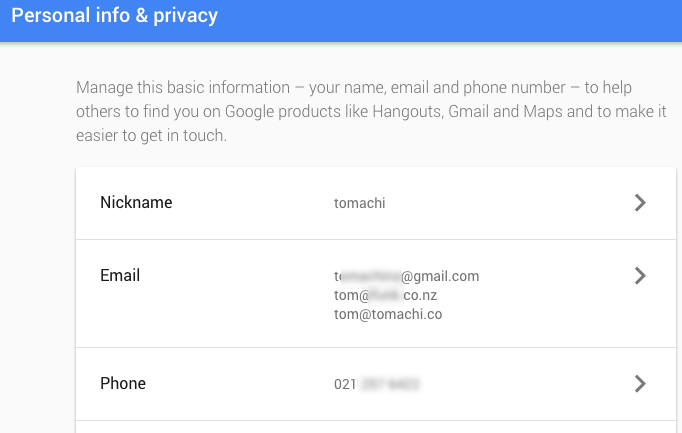 Many people trying to use GMail for business might not be aware that it's possible to associate your favourite long-time domain email, or even your shiny new company email to your old Google Account. 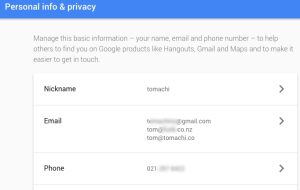 If Google says your email is already associated with another Google Account, it's no problem - so long as you still can either remember your password or still have access to the email for that account. Call Tomachi Corp today for support 0212576422.